Industrial Biscuit Production is a practical reference that brings a complete description of the process and equipment for an automated food production line in the food biscuit industry. The book also describes the existing and emerging technologies in biscuit making and production, being a valuable asset to R&D personnel and students in the food technology and engineering areas. 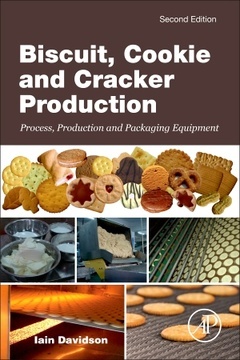 Full of clear illustrations, photos and text describing the complete production process for all types of biscuits, cookies and crackers from the raw materials to the final packaged products, this title covers biscuits and its ingredients, test bakery equipment, dough piece forming, biscuit baking ovens, biscuit cooling and handling, processing and packaging. Iain Davidson shares his almost 50 years of experience in the biscuit baking industry worldwide to students, researchers or people joining a biscuit making company.